In 1956 the 18 year old Walter Marchetti won an Italian tv quiz show. He went on to become a notable avant-garde composer (notably co-founding ZAJ) and a confirmed friend of John Cage, whom he helped win the same quiz a few years later. This piece attempts to revivify Marchetti’s experience, using transcripts of the original television broadcasts. Ernesto Tomasini plays over-the-top quiz master Mike Bongiorno and the taciturn Walter Marchetti in this poorly recorded live performance of “Lascia o raddoppia?” at Raven Row, London, July 2011, by the Resonance Radio Orchestra. Featuring Tom Besley (electric guitar), Adam Bushell (percussion), Olly Porter (electric guitar), Elly MacDonald (violin), and Chris Weaver (electronics). 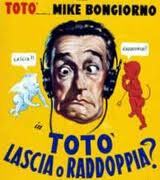 Written and directed by Ed Baxter as part of “Gone with the Wind.” Note: the text is in Italian. reboot.fm is proud to be a founding member of the award winning radia.fm network! radia.fm - Lascia o raddoppia? Posted on November 13, 2011.